Susan grew up in Phoenix at Central and Camelback, moved away for 20 years living in California, Alaska and Oregon. 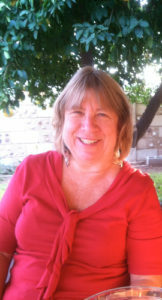 Susan returned to Arizona with her son, Jonah, living in Tucson for 9 years where she attended University of Arizona earning her bachelor’s in nursing. In 2001 she moved back to Phoenix purchasing her Sweetwater Cox Meadow’s home and began working as an R.N. at John C Lincoln Hospital. Susan worked as an open heart nurse in the I.C.U. until she retired July, 2013. She and her fiance’, Mike, love to hike, bike, swim, and travel. Susan loves being in Cox Meadows because she is near the beautiful neighborhood park and bike paths, as well as, Phoenix Mountain Preserves. Susan is very glad to network with neighbors and looks forward to serving in the position of Sergeant-At-Arms where she hopes to promote our wonderful Cox Meadows Neighborhood Block Watch group!